Even though there is court hearing scheduled for Friday to lift the temporary restraining order on Gov. Cooper’s plan to close the coverage gap, leaders at the North Carolina General Assembly want to extend their efforts to block 500,000 North Carolinians from getting health coverage. Yesterday, Senate leader Phil Berger and House Speaker Tim Moore filed court papers inthe case asking the judge to reject Gov. Cooper’s request to lift the temporary restraining order so that veterans, children, parents, and low-wage workers can finally gain access to health coverage. Despite reports of Medicaid expansion’s success, opponents of closing the coverage gap continue to act on their misguided belief that expansion some how dis-incentivizes job seeking and will be costly. In fact, recent reports show that state spending for Medicaid expansion is decreasing just as CMS predicted. What’s more, reports continue to show that 62 percent of adults in the coverage gap belong to families that have either a full-time or part-time worker in their household. 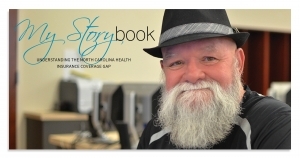 In North Carolina, 56 percent of adults in the coverage gap work for small businesses, like Jerry (pictured at left). Like others in the coverage gap, Jerry is college educated, and like many of us has faced hardships. When he lost his job at a small business, Jerry worked hard to find new employment. He went back to school and even started his own IT business. Unfortunately, lawmakers continue to block Jerry’s path to health coverage. Jerry and thousands like him remain in the coverage gap. They make too little to qualify for financial help to purchase health coverage through the Marketplace and do not meet the eligibility for Medicaid. The General Assembly’s Medicaid Blockade is harmful. The block on Medicaid expansion hurts real people like Jerry who are working hard to make ends meet and contribute positively to their communities. The Medicaid Blockade prevents hard workers like Jerry from being able to address his chronic conditions like diabetes and sleep apnea so that they can be even more productive. Let’s fervently hope that they legislative leaders changes their minds soon before their policies help to ruin even more lives.